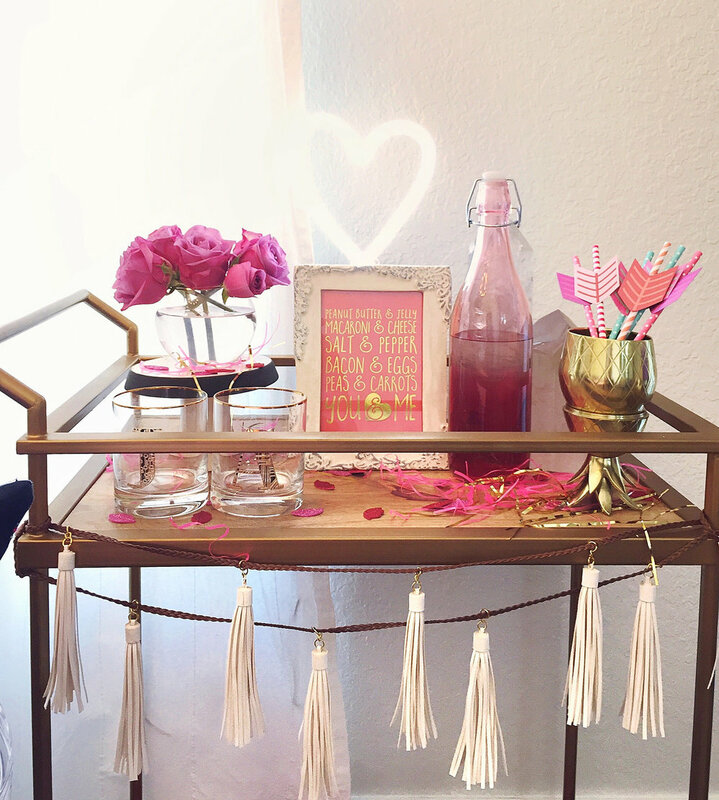 We have been loving, well more like lusting, all over the girl parties highlighted from amazing creatives all over the web. 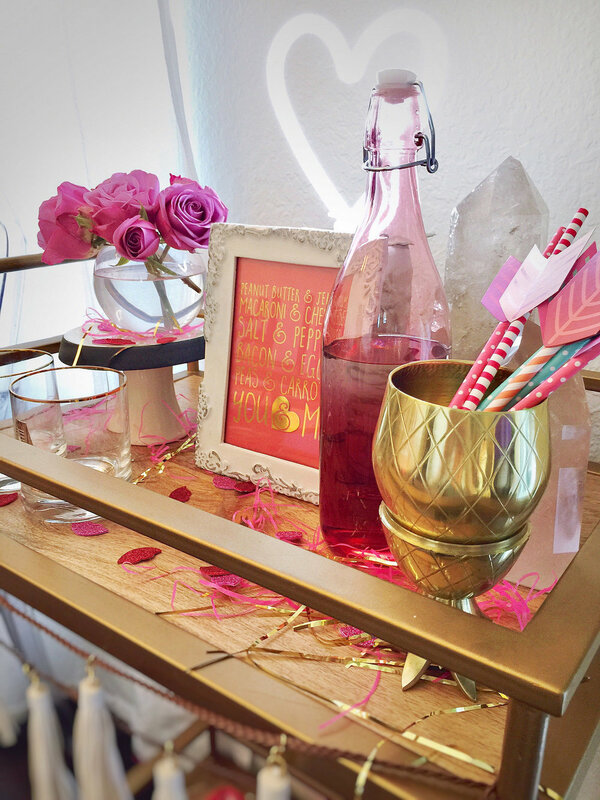 From disco glitter to candy colored heart themes, we are totally down for a soul sister evening. 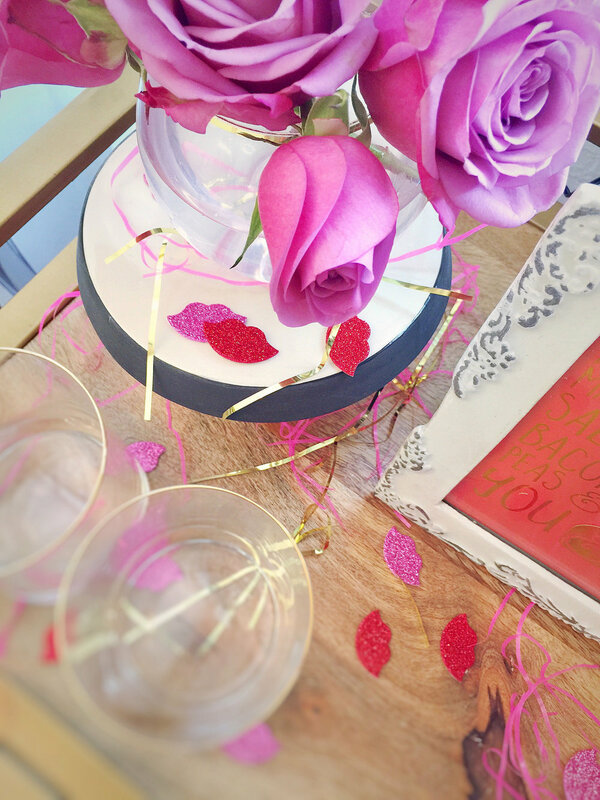 Here at Forrest and J we felt being a bit more romantic this Heart Day and creating a Rosey Metallic palette for you and your scrumptious sweetheart. 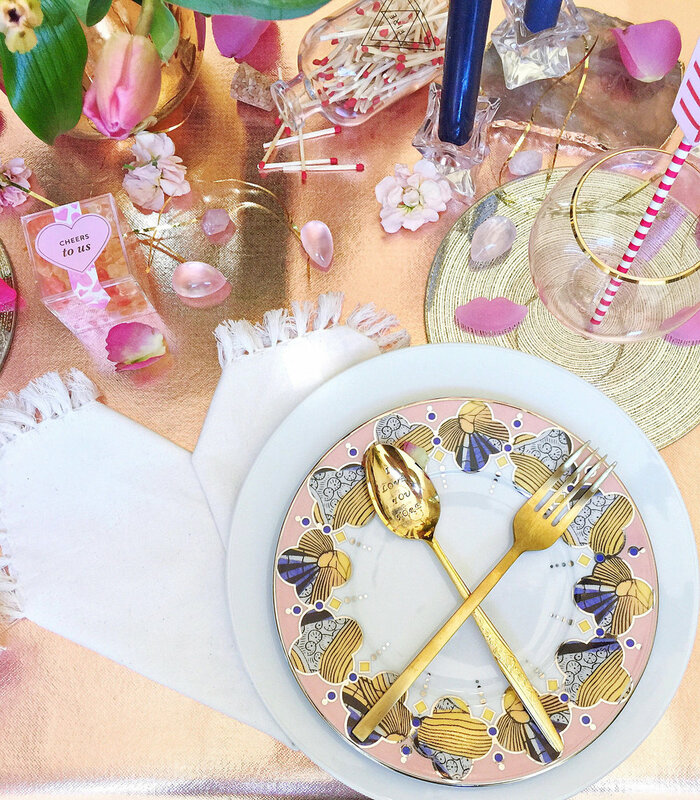 We're kicking off our heels and snuggling up under candlelight at this flirty table setting. 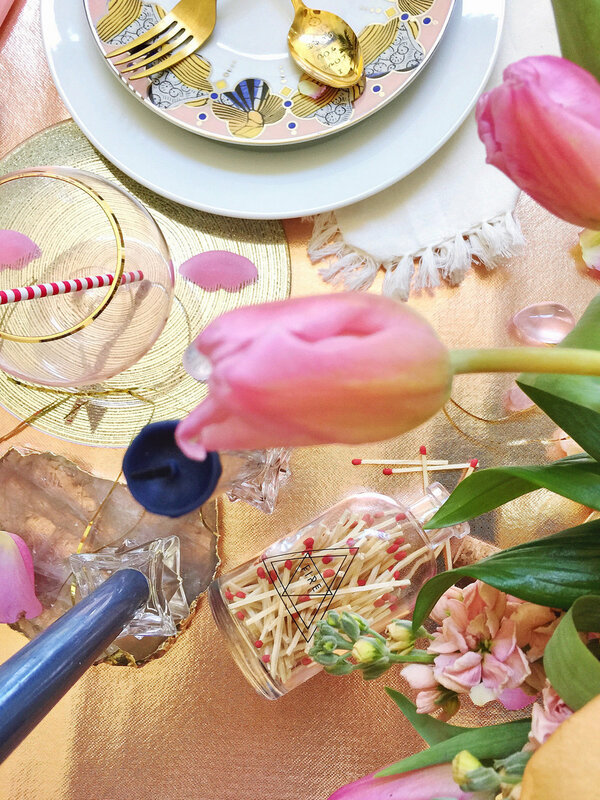 A shimmery tablecloth in rose gold is a bit unexpected and will make every girls heart go all a flutter. The art deco plates are from Anthropologie were the perfect inspiration for the moody color palette of navy blues, marigolds, and dusty purples. Keeping with a NY art deco state of mind, we loved this Kate Spade 'Manhattan Room' cheese plater hosting all our Valentine sweets. Oh and that gold lady planter! Oh Joy you be still our hearts with all your whimsy treasures. She was the perfect finishing detail for our lovers sugar feast. Getting creative with napkins can be just plain daunting - you know you feel me out there stylists. But this heart folded style was too much fun to resist! 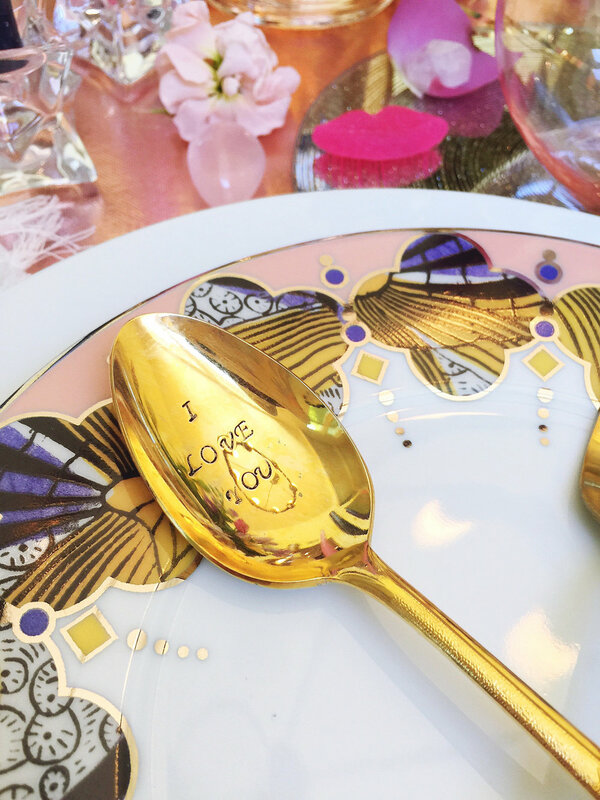 Impress your boo, little sweeties, or gal pals by setting your table with these. Check out our girl Lauren Conrads tutorial and make your own. This weekend we were in Palm Springs enjoying some much needed sun and stubbled across this gorgy gilded ballon 'PARTY' sign. We become fast friends and brought this little guy home with us. Florals: Trader Joes / Design & Styling: Forrest & J / Dishware and glassware: Anthropologie / Party decor, neon heart: Target / Gold lady planter: Oh Happy Day for Target / Sweets: Sugarfina / Fringe napkins: Opt by No Rest For Bridget / Candlesticks, holders, rose gold tablecloth: Hobby Lobby / Gold pineapple tumblers: The Pineapple Co.